Śīlabhadra (Sanskrit; traditional Chinese: 戒賢; ; pinyin: Jièxián) (529–645) was a Buddhist monk and philosopher. He is best known as being an abbot of Nālandā monastery in India, as being an expert on Yogācāra teachings, and for being the personal tutor of the Chinese Buddhist monk Xuanzang. Śīlabhadra was born in the Samataṭa kingdom, in the Brahmin caste, to the royal family there. As a young man he went westward to Nālandā, and was trained there by Dharmapāla of Nālandā, who also ordained him as a Buddhist monk. According to Xuanzang's account, Śīlabhadra gradually became famous for his learning even in foreign countries. At 30 years old, after defeating a Brahmin from southern India in a religious debate, the king insisted on giving him the revenue of a city, which Śīlabhadra accepted with reluctance, and he built a monastery there and kept it funded it with the city's revenues. The name of this monastery was Śīlabhadra Vihāra. He was then very old, his nephew Buddhabhadra being 70 years of age. The pilgrim was met by twenty grave-looking monks, who introduced him to their chief, the venerable "Treasure of the True Law," whose proper name of Śīlabhadra they did not dare to pronounce. Xuanzang advanced towards him according to the established etiquette on his elbows and knees, a custom which is still preserved in Burma under the name of Shikoh. Xuanzang records the number of teachers at Nālandā as being around 1510. Of these, approximately 1000 were able to explain 20 collections of sūtras and śāstras, 500 were able to explain 30 collections, and only 10 teachers were able to explain 50 collections. Xuanzang was among the few who were able to explain 50 collections or more. At this time, only the abbot Śīlabhadra had studied all the major collections of sūtras and śāstras at Nālandā. Xuanzang was tutored in the Yogācāra teachings by Śīlabhadra for several years at Nālandā. Upon his return from India, Xuanzang brought with him a wagon-load of Buddhist texts, including important Yogācāra works such as the Yogācārabhūmi-śastra. 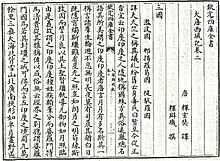 In total, Xuanzang had procured 657 Buddhist texts from India. Upon his return to China, he was given government support and many assistants for the purpose of translating these texts into Chinese. Śīlabhadra considered the teachings from the third turning (Yogācāra) to be the highest form of Buddhism, because it fully explains the three natures, but the Mādhyamaka teacher Jñānaprabha notably opposed this idea. Instead, Jñānaprabha regarded Yogācāra teachings to be below Mādhyamaka, because they (purportedly) posit the real existence of a mind. Śīlabhadra composed the text Buddhabhūmivyākhyāna, which is now extant only in the Tibetan language.